Situated near the confluence of the Ouse and Ouzel in Newport Pagnell, Tickford Priory was founded by Fulk Paynell, the Norman Lord of the Manor and local Sherrif, in 1140. It was a cell of the Cluniac monastery of Marmoutier at Tours in France. This meant that most of its 16 monks came from France and that the Prior of Tickford, was under the control of the Abbot at Tours, not the local Bishop of Lincoln. A fact which was to cause a lot of trouble at Tickford. One of the earliest Priories locally and one of the richest. Tickford acquired a number of buildings (see the priory plan). Some of the local noblemen made donations of land, churches, including Willen, and at least one mill (Caldecote) to the priory. 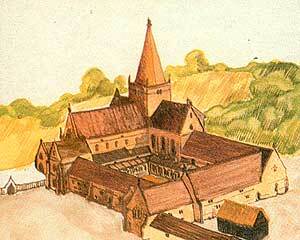 Thus Tickford Priory played an important part in the life of the local community. As part of their duties monks also offered help to those in need. Therefore, good priories could benefit the local community in several ways. However, Tickford Priory was not well run; it was too small and Abbot too far away to work well. It was difficult to recruit enough good men to become monks and the men appointed to be Prior were frequently of a poor character. As a result the records reveal a history full of incompetence and scandal. Tickford was finally closed in 1524 by Cardinal Wolsey.